The Alesis Strike series of electronic kits was a real hit amongst drummers owing to their incredible feel, clarity and versatility. Alesis have now expanded this range with the Strike Multipad Percussion Pad With Sampler And Looper. Packing in a whopping 6GB of preloaded samples and loops, 32GB memory, velocity sensitive pads with RGB lighting, expandable connectivity and much more, drumming and beat-making of this standard has never been so portable. At its core, the Strike Multipad gives you the ability sample, edit, loop and perform with quality and ease of use at the forefront. To get your inspirational juices flowing you have access to over 7,000 samples and loops that span many styles. Hardened acoustic players through to EDM producers are catered for without compromise. Of course, Alesis realise it's imperative that you are empowered to make your own bespoke sound and to that end, the Strike Multipad is capable of storing up to 32GB of data and can be easily expanded with USB flash devices. In short, the Strike Multipad makes your creative library limitless. With access to all of this premium quality sample data Alesis have ensured that the trigger pads of the Strike Multipad are incredibly responsive. The nine velocity-sensitive pads are outfitted with customisable RGB lighting that displays velocity, loop length and more. Performing in dark or foggy venues is no longer an issue and despite it having a primarily practical purpose, the RGB lights also look really cool when you're playing. 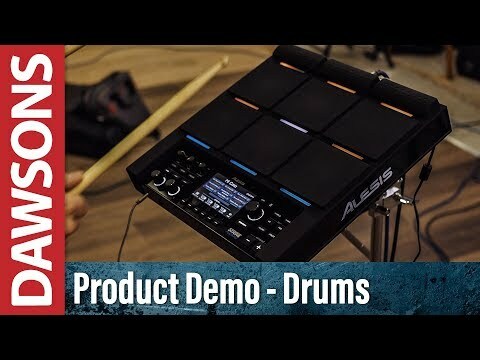 Whilst the Alesis Strike Multipad is more than capable of delivering epic performances on its own, Alesis have made sure that it can integrate into any live or studio setup. First of all the Multipad comes with a built-in 2-in/2-out audio interface for seamless connectivity with your computer for use with the included Ableton Live Lite and Avid Pro Tools First software - or any DAW of your choice. Audio and trigger connectivity isn't lacking either - 2 headphone outputs, aux connectivity for routing and sampling audio of your choice be it from a music player or microphone along with master outputs take care of all your audio needs. Want to use external triggers and foot pedals? The Strike Multipad welcomes this with a single zone input, 2 dual-zone inputs and a hi-hat pedal input so that you can turn the Multipad into the centrepiece of your performance rig. The Alesis Strike Multipad may be powerful and versatile but thanks to its logical, clean layout and crisp 4.3" screen you'll have no problem working your way around. And herein lies another key to the Multipads success - a pure focus on performance. With the Multipad you're getting a powerful sampler, looper, trigger, controller and audio interface all wrapped up into one solid, beautiful unit.